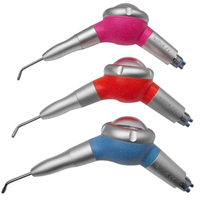 The prophy appointment remains at the heart of the routine dental visit and many practices have added Dental Air Polishers or Air Prophylaxis Machines to their procedures. These systems use high-pressure air to propel special powders at a patient’s teeth. The abrasion action of the powder provides a high quality polish. When selecting a dental air polisher it is important to understand the types of powders that are compatible. It also is important to be properly trained on air polishing, to have the proper safety and personal protection equipment in the practice, and to select patients who are good candidates for air polishing before beginning treatment.